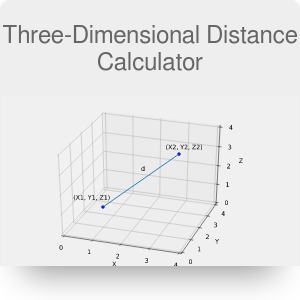 Our three-dimensional distance calculator is a tool that finds the distance between two points with given coordinates in space. If you want to determine the distance between two points on a plane (two-dimensional distance), use our distance calculator. (x₂, y₂, z₂) are the coordinates of the second point. Notice that the value obtained when using this formula is always positive. This is because we consider a scalar value of distance - it does not depend on the numbering of points. Choose the coordinates of the first point - for example (1,1,1). Choose the coordinates of the second point - for example, (3,6,9). Three-Dimensional Distance Calculator can be embedded on your website to enrich the content you wrote and make it easier for your visitors to understand your message.